Bursagaz, one of the most important Turkish gas companies, will have a new headquarter which is aiming to obtain the LEED Gold rating. Onyx Solar is responsible of developingoriginality in the design by superimposing a mosaic double skin onto the façade. The glass, featuring crystalline silicon, will have 20% transparency, allowing homogeneous light into the building and reducing the need of artificial lighting. In addition, the company Sunvital Enerji will carry out the installation of the photovoltaic glass in this façade. Adhering to the Bursagaz corporative strategy of developing innovative projects that contribute to a more sustainable future, this project exemplifies one of many reasons why Bursagaz is well accepted in the market. We are currently developing a unique project in Denver, Colorado, with theNorth American constructor GH Phipps. This pyramidal shaped building, composed of hexagonal photovoltaic glazing in crystalline silicon, has been a new challenge for Onyx Solar. Onyx Solar participated in the Mexico`s most important real estate event with the official distributor in the country, Vázquez Vela Group. We were visited by some of the largest real estate developers and architects such as Gigante Inmobiliario Group, Inmuebles Carso, Pachuca Group, Michael Edmonds, and Fernando Romero. Even the head of DF Government, Miguel Angel Mancera stopped by to confirm his commitment in sustainable construction, as well as to recognize the importance of integrating photovoltaic energy in the urban buildings with Onyx Solar innovative solutions. In addition to the photovoltaic gallery and photovoltaic ventilated façade, Onyx Solar has coordinated the implementation of other innovative energy efficient measures in this house. These retrofitting works are framed within the HERB project, an R&D project funded by the European Commission where Onyx Solar collaborates with European academic institutions and industrial partners. Its main objective is to study and implement innovative measures for the Holistic Energy-Efficient Retrofitting of Residential Buildings. The photovoltaic Low-e glass of Onyx Solar will transform the new terminal at this modern airport, one of the largest in South America, in a building that generates its own energy from the sun. 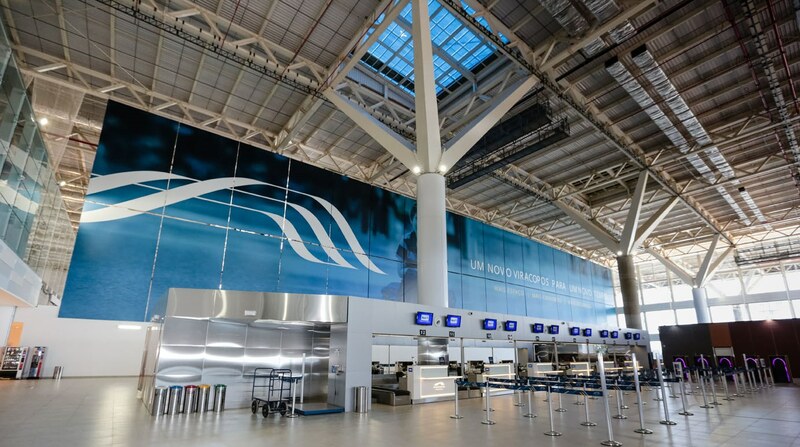 Onyx Solar has provided the International Airport of Viracopos-Campinas with more than 4,000 photovoltaic glass units which will cover a total area of 3,240sqm. The photovoltaic installation will reach a total capacity of 117 kWp. 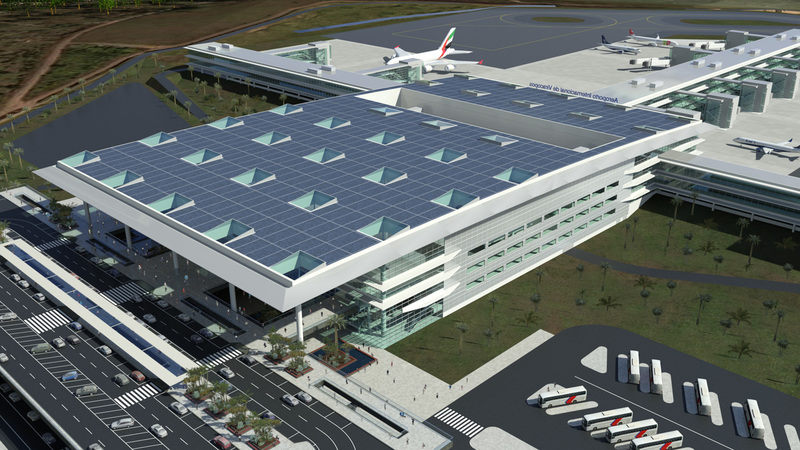 The project at this incredible Brazilian airport signifies the largest South American project yet for Onyx Solar. This photovoltaic low emissivity glass is being installed on the building’s roof as 33 skylights. The beneficial characteristics include its semi-transparency to allow the diffusing of the sunlight; protection against solar radiations (UV & IR); and thermal and acoustic insulations. Due to the nature of the continuous flow of aircrafts in the vicinity, the acoustic insulation has a great deal of importance. The Viracopos International Airport is located in the city of Campinas, an important Brazilian center of scientific, technological, and industrial development, part of São Paulo. Known for harboring major university centers, the city has an access to the best roads in the country and has a large industrial park in its metropolitan area. Viracopos, the second largest cargo terminal in Brazil, has been experiencing a significant increase in the passenger transportation over the recent years. It is one of the fastest growing airports in the country. The goal of the Viracopos International Airport is to become the largest and most modern airport in Latin America with the capacity of receiving 25 million passengers annually. Onyx SOLAR’s glass is the only building integrated photovoltaic material which can generate electricity from the sun. Taking into account that buildings are responsible of the 40% of the global electricity consume. What do you think that will be the impact of such a revolutionary product in Portugal? Is the beginning of a new cycle for constructions solutions! Recently, the Portuguese Government had approved a law that allows renewable production to auto-consume. This means that, every building can integrate solutions of sustainability to be independent in an electric point of view. At the same time, we can produce green energy and maintain the higher standards in architectonic point of view. It’s a “new age” and some players have already discovered. Our multifunctional Building Integrated Photovoltaics (BIPV) solutions allow for the entry of natural light, provide both thermal and acoustic insulation, it filters out harmful radiation, which can be integrated perfectly into any type of building. How´s the acceptance of this passive-active material in Portugal market? Positive. Usually the first impression is of surprise, but when we talk about prices and studies already made, comparing with others types of glass, the expectations are largely exceeded. Onyx Solar ‘s solutions produce green energy and at same time, allow a better management inside the building. Moreover, allow to recover the initial investment. Onyx Solar has recently installed the first photovoltaic floor in the world. Thanks to our continuous investment in R&D we are regularly launching new products, such as our colored photovoltaic glass. We recently lauched the first low-e photovoltaic glass. What is your opinion? Floor, colored glass and low-e glass are unique, saying everything about the quality of Onyx Solar’s R&D Department, which is constantly innovating. The low-e photovoltaic glass is one of the best arguments that we use because the prices and result of studies made with the performance of this solution are impressive. Onyx Solar has completed lot of projects in several countries including the United States, Mexico, Brazil, Italy, Spain, France etc. How do you see our building integrated photovoltaic solutions related to the increasing green building trends over the next few years in Portugal? In Portugal, the construction has passed for a period of adjust. This reality, made the main quality players, adapt solutions more efficient and sustainable. On the other hand, we have some expectation to know the main guide lines for Portugal in the European program Horizon 2020, but we believe the future construction will be focused on goals like the sustainability, low CO2 emissions, and efficient buildings. In the United States we provided a turnkey project for the world’s largest BIPV skylight. Our company has a wide network of distributors and installers worldwide; in a key market like Portugal we have established this scope of cooperation in order to offer our customers a complete service. May you slightly explain your experience at this respect? The know-how and excellence of monitoring provided by OnyxSolar has been crucial in our approach to the market. In big projects, the capacity that we have (Onyx Solar and we) to offer global and integrated solutions is very important. The global management of the building actually requires global and holistic solutions. The accuracy and detail in the studies and projects has been very important as well, not only at technical and commercial level but also for the financial plan. Since your incorporation within the Onyx Solar network, could you briefly sum up your feeling as our official Distributor over this time? Please, in a few words any recommendations for our future distributors? We consider it a stimulating challenge! Not only on the potential business but also for the permanent evolution and learning. Onyx Solar is a company and brand with big success in the world… is not by accident. The team is young, dynamic, resilient and available. When you start working with Onyx Solar you will meet people that think big, and make things happen! Big success is waiting, in the near future! Silva & Ventura will exhibit at Glasstec in Dusseldorf, Germany (October 21st – 24th ), Hall 10/ C76, with its structural systems for glass façades and smart glazings such as the Onyx Solar’s PV Glass. Find more information about their fastening systems at the Partners Solutions’ tab in the Onyx Solar website, within the all you need section. Due to the high quality of the photovoltaic glasses added and the excellent installation performed, allow the system to produce 17% more than estimated, thus the skylight is producing 328.000 kWh/year facing 272.000 KWh/year calculated. It’s been a year since Onyx Solar completed the execution of this project, the largest glass photovoltaic skylight in the world. Its 2500 m2 of photovoltaic glass are part of the new Novartis Pharmaceuticals’ headquarters in New Jersey, United States.